Poor Boy Rappers - Low Rider Rap. Vinyl 12. Bleep. 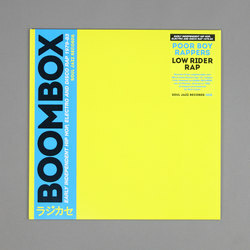 Ask anyone who copped the recent third instalment of Soul Jazz Records’ Boombox series what they thought of the compilation and they’re likely to cite Poor Boy Rappers’ ‘Low Rider Rap’ as one of the album’s highlights. The 1982 tune is an ebullient mix of electro-rap groove, funk guitars and fresh B-boy steez from the West Coast crew. No wonder copies of the original single have been known to fetch four-figure sums on the second-hand trail. Those of you with a little less cash to burn will be pleased to see that Soul Jazz are reissuing the tune as a solo edition. Comes backed with the instrumental.